Getting in touch with one's inner self isn't always a pleasant process. Sorry the truth is so painful. Try not to let it dent your self-esteem. Perhaps you shouldn't base your self-perception on reality. You could try a happy delusion. Many humans have had great success with this method. You see? 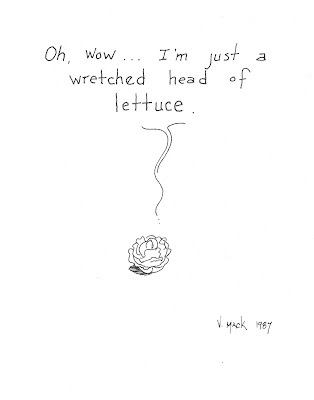 That's why I'm just a wretched head of lettuce. I will meditate on self-actualizing into a bowling ball! - Lettuce Head...er...BOWLING BALL! Hey what are those bugs doing in my leaves?